A brother and a sister in 1990s America. Jennifer is far more interested in boys and partying than schoolwork. David is a geek, unseen in his own way, and obsessed with a 1950s Leave it to Beaver type television show called Pleasantville. A little bit of magic and they end up in the world of Pleasantville; 1950s America, with all the hot apple pies, sodas, sexual stereotypes and racism that anyone could want. I really like this film. There’s not much that you would not expect from this film; fighting injustices as people discover who they really are. I found it clever and entertaining the first time around, and I’ve watched it several times since and really enjoy pretty much everything about it. 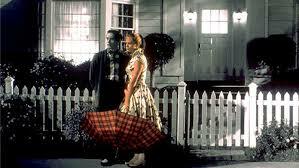 Pleasantville was nominated for Oscars for Best Art Direction – Set Decoration, Best Costume Design and Best Music, Original Dramatic Score.